Special handset is available in English for children. Disabled Parking on Level 3 of Ocean Terminal. 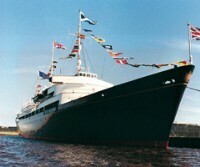 Visit The Royal Yacht Britannia, now in Edinburgh's historic port of Leith. The experience starts in the Visitor Centre where you can discover Britannia's fascinating story. Then step aboard for a self-led audio tour (available in 11 languages) which takes you around five decks, giving a unique insight into what life was like for the Royal Family, Officers and Yachtsmen. Following Britannias move to Ocean Terminal in October 2001 there is even more to see with the opening of further areas of the ship including the Royal Marines Barracks, the Laundry and the Sick Bay.